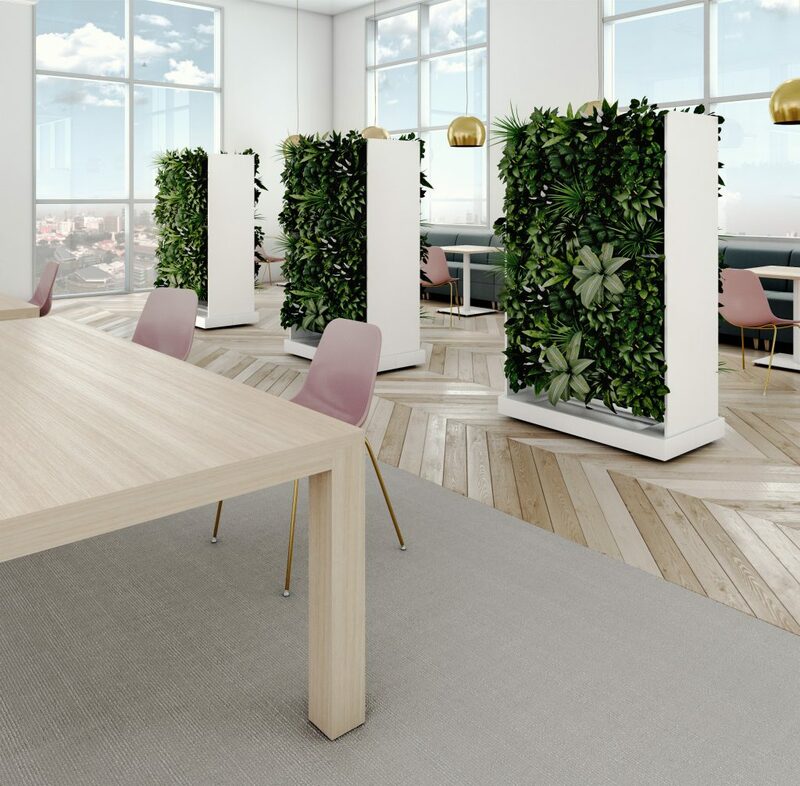 In the latest post of our series on biophilic design we will examine the Nevins products bringing the natural benefits of biophilia into workspaces around the country. 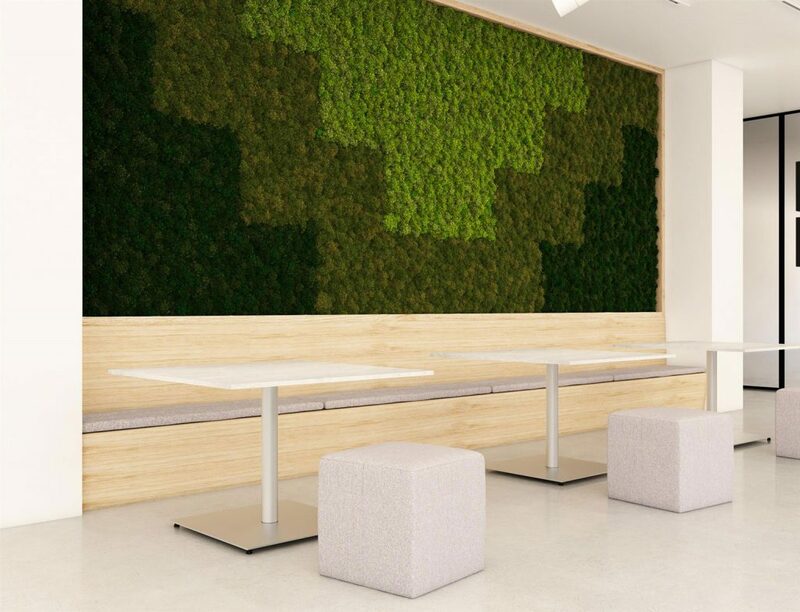 As we explored in our last post (here) the research surrounding the benefits, both mental and physical, that biophilic designs bring to the workspace is compelling. But beyond the benefits of just bringing “the outdoors in” is the connection that these biophilic products bring us with nature in an ever-increasing urban world. Nevins kicked off 2018 in a big way with the launch of Bio Canvas walls followed by Bio Canvas room dividers. Bio Canvas is made up of panels featuring the following sustainably harvested materials: reindeer moss, poplar bark, and light stone. Off the bat, one of the main draws of Bio Canvas is the zero maintenance required for upkeep. Even the moss has no light or water requirements. It becomes more brittle in dry environments and more pliable in humid environments, therefore, functioning as a natural humidity gauge. 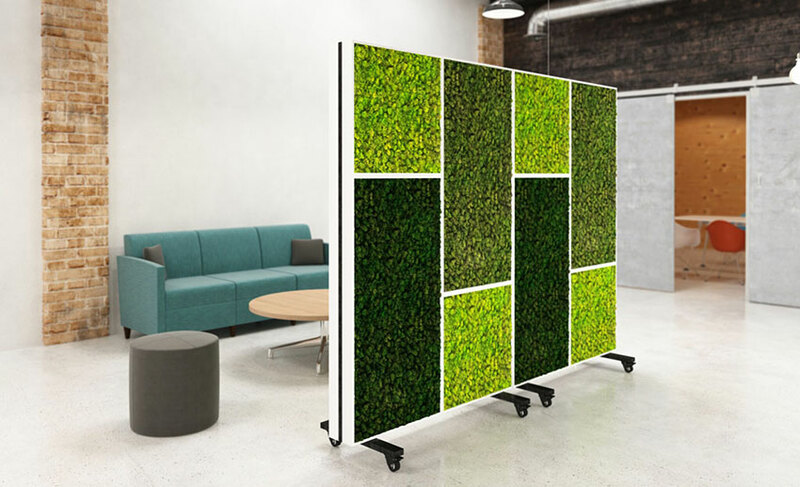 The zero maintenance makes Bio Canvas absolutely the easiest way to bring biophilic design into workspaces large or small. The most popular panel for Bio Canvas is the moss and it is easy to understand why. The moss is harvested in Northern Europe through hand cutting thereby ensuring regrowth. Following harvest, the color is perfected. 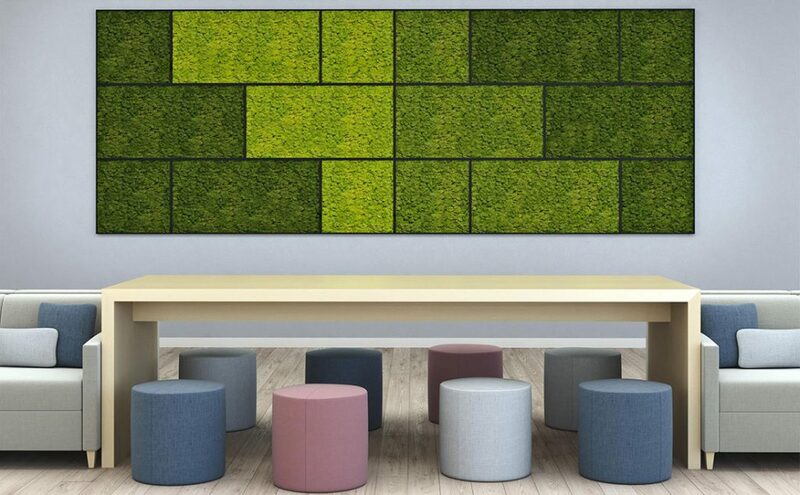 Bio Canvas moss is available in three shades: lime green, medium green, and forest green. The shades are achieved through a propriety method of dying the moss with a natural food coloring agent which provides long-lasting color stability. Then the moss is preserved using a vegetable-based preservative, therefore, avoiding any toxic and dangerous chemicals. The final result is three beautiful moss options to fit whatever your concept is for your own Bio Canvas. Additionally, moss naturally possesses high-end acoustic attenuation properties which allow it to capture medium – high voice frequencies. What this means for the workplace is shrill tones are dampened and muted making concentration easier and productivity higher. After moss come bark and light stone panel options. The bark featured in Bio Canvas is sourced from Yellow Poplars in the Appalachian Hardwood Region (AHR) in the eastern United States. Repeated studies from the U.S. Forest Service show the sustainability and increasing forest for Yellow Poplars. These Yellow Poplars are most often used in the production of furniture but the bark has been typically discarded (its light shade makes it undesirable for mulch). Bio Canvas sources this wasted bark for use in the panels. Finally, the light stone panels are the third option for Bio Canvas panels. Available in the finish shades of Prairie Brown and Mountain Grey, the light stone panels are a combination of natural stone and resin. This combo is ideal as it makes the stone panels much lighter than raw stone would be. The plentiful options for Bio Canvas make it highly versatile. 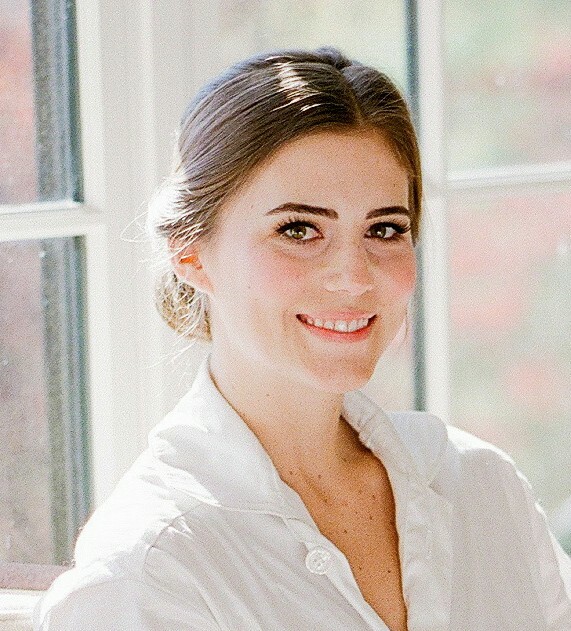 But what really makes Bio Canvas stand out is its total commitment to non-toxic components, eco-friendliness, and the level of long-term quality. Leaf Living Walls is the leafier sibling of Bio Canvas. Also available as room dividers and hanging walls, “Leaf” is all about the plants. Including but not limited to 16 different plant varieties Leaf showcases hanging and upright plants on a group scale. A sophisticated watering and lighting system makes maintenance nearly automatic – a standout feature in the world of living walls. The many benefits of living plants in an indoor environment are very much present with Leaf. 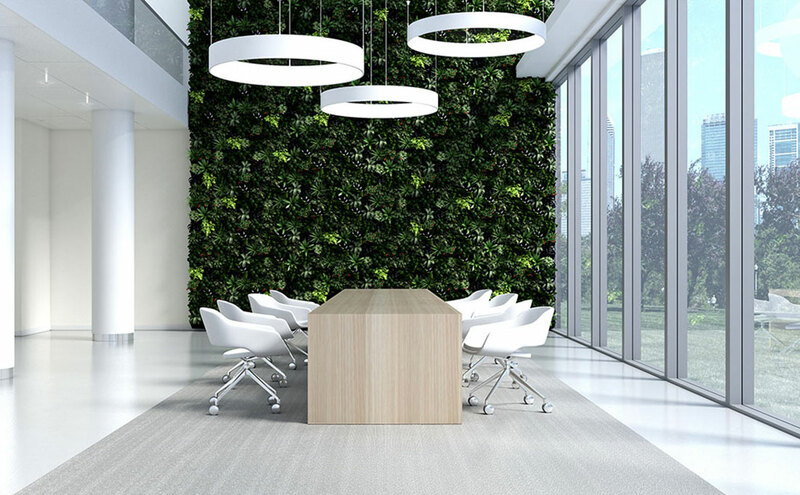 Natural air quality filtration and sound absorption are two of the most well documented physical environment benefits offered by living plants indoors. However, many studies also suggest the mental side effects of plants in work environment include increased productivity, increased focused, and overall mood boosts. While the trend of bringing the outdoors in is ever increasing in popularity so is the trend towards urbanization throughout the world. Today, 82% of North Americans live in urban areas and are increasingly concentrating in mid-sized and large cities (source: United Nations, Department of Economic and Social Affairs, Population Division). It is no wonder that with this widespread urbanization designs to incorporate the natural world into our man-made world are increasing. Nevins started in 1976 selling planters, still some of our hallmark products today, because we believed in incorporating life into workplaces. That same spirit carries us through into today with all of our products. 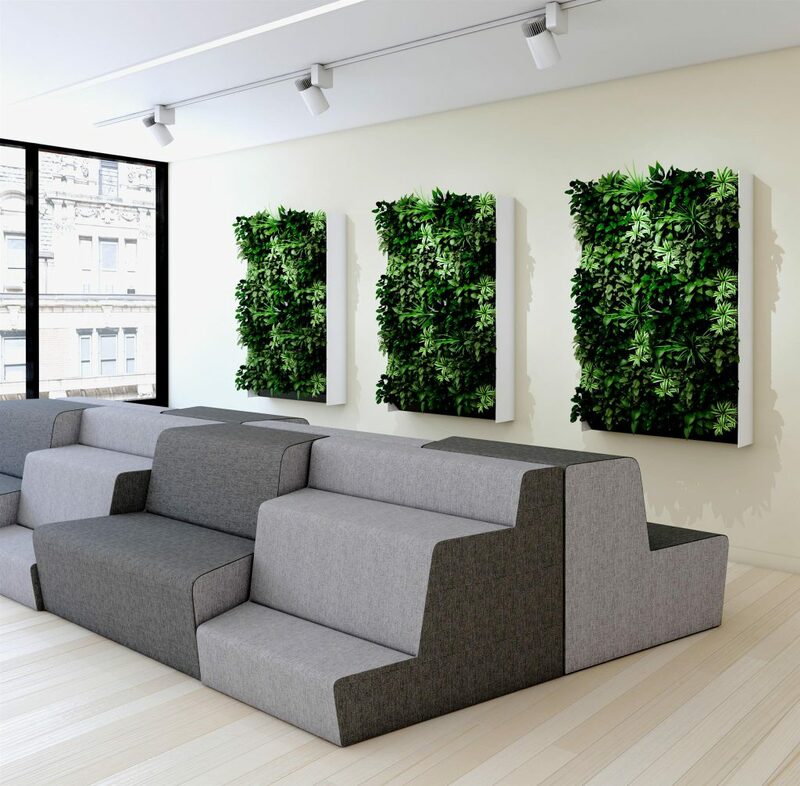 Leaf and Bio Canvas are a way to show our commitment to cutting-edge, functional biophilic designs with the all the choices Nevins is known for. Solutions by (moss, bark, stone, plant) choices!